Lawns suffer from fungal disease if the soil is not well drained or if wet weather prevails for several weeks/months. The accumulation of thatch will compound this problem. Dollar Spot: Mowers, feet and pets all assist in the spread of fungal diseases in lawn, but Dollar Spot is one of the most likely diseases to be encountered in Queensland Blue Couch. 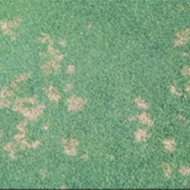 Only minimal incidence of the Dollar Spot fungal disease has been noticed in Aussiblue. Cobwebs appear and then yellow blotches, which turn brown and finally bleach to a straw colour. The individual spots (20c-piece size) may sometimes join to form large irregular patches. 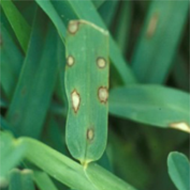 Grey leaf spot: Buffalo can be prone to the fungal disease Grey Leaf Spot. Strawy-coloured patches appear on the leaves. You will find most fungal diseases disappear when the lawn begins to grow rapidly after the winter months. But it is important to know when to use chemicals when they are necessarily needed. Think environmentally – don’t spray unless necessary. TIP: If you have a suspicion that you have a fungus in the lawn, DO NOT apply fertiliser. The nitrogen will only help to compound the problem.